During the most recent excavations, marine archaeologists recovered several new statue fragments. ARMED WITH ADVANCED TECHNOLOGIES, MARINE ARCHAEOLOGISTS have returned to the “Antikythera Shipwreck,” the remains of a Roman-era cargo ship some 180 feet below the surface just off the Greek island of Antikythera. It was first discovered by sponge divers in 1900. In early October, the archaeologists revealed the discoveries from their 16-day 2017 expedition, including several important fragments of statuary – a plinth with two marble feet, part of a bronze toga or robe, a superb bronze arm and a tantalizing bronze disc about three-inches across and with the image of a bull carved into it. Excavations by the sponge divers and the Greek Navy when it was first found yielded a wealth of art treasures – hundreds of artifacts, including amphorae, glassware, bronze and marble statues, a multitude of “orphan limbs” from otherwise missing statuary – and the fantastic Antikythera mechanism, now believed to be an ancient astronomical computing device. 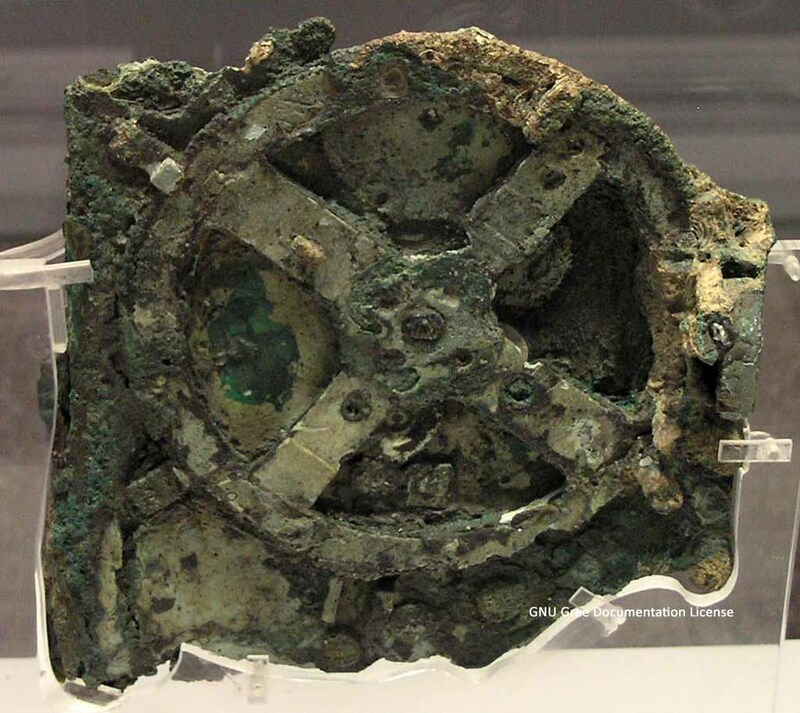 Many scientists now think the “Antikythera Mechanism” is a device for caculating astronomical movements. Dating from the 1st or 2nd Century BC, the 130-foot ship is believed to have been carrying luxury items in demand by affluent Roman citizens of the day – including Greek statuary, jewelry and other artistic treasures. It’s considered the richest ancient wreck ever discovered, with much remaining buried in the sediment. Following the 1900-1901 work, the site was basically left undisturbed until Jacque Cousteau visited it in mid-century, excavating for several weeks in the 1950s, returning to shoot a documentary in the 1970s – and then, left alone again. 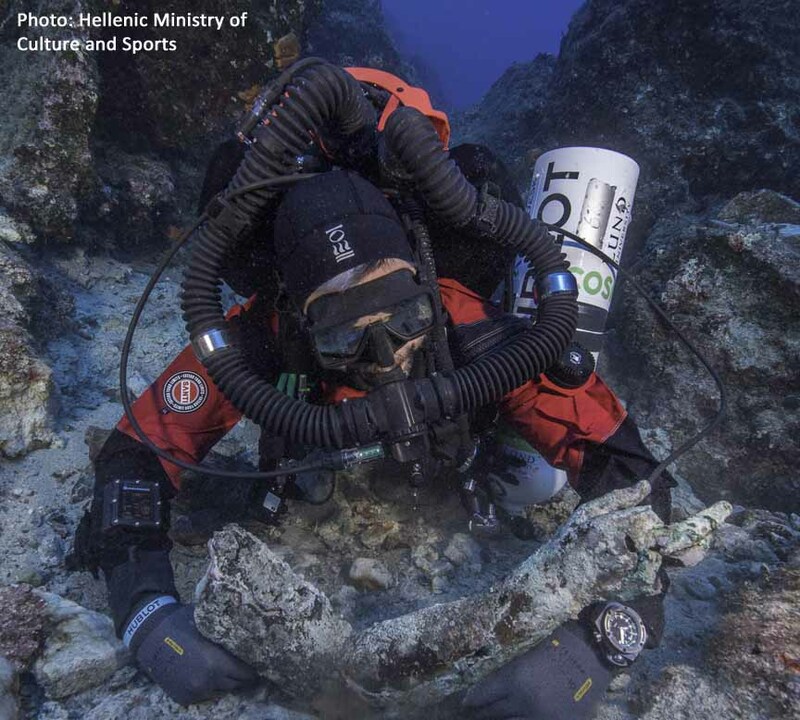 In 2012 marine archaeologists began returning to the wreck under the direction of the Greek Ephorate of Antiquities with modern resources, mapping the site and finding intact pottery, the ship’s anchors and other objects. In expeditions since then, they’ve found gold jewelry, a sarcophagus – and skeletal remains, whose DNA analysis has yet to be revealed. The 2017 finds are the first significant statuary to be found in the renewed explorations. The fact that they were recovered in an area not previously excavated gives the archeologists hope that more statuary remains to be found. The new site was buried beneath boulders moved their by seismic activity over the millennia. PRINCIPAL SOURCES: Return to Antikytherra, “A Project of the Hellenic Ministry of Culture and Sports,” “Antikytherra shipwreck yields statue pieces and mystery bronze disc;” ” Ancient Greek Shipwreck Statues Found,” National Geographic.